← DisOrient 2011 – That’s a wrap! We are excited to announce the award winners for the 6th Annual DisOrient Asian American Film Festival of Oregon! This year, we unveiled a new award honoring DisOrient’s commitment to social justice in Asian American film. Each year, the award will recognize a film for its commitment to social justice through extraordinary filmmaking. The Jason D. Mak Award for Social Justice also honors our festival’s founder, Jason D. Mak, for his vision and commitment. DisOrient would not be the festival it is today without him. The 2011 recipient of the Jason D. Mak Award for Social Justice is the moving feature documentary by Emma Rossi Landi and Alberto Vendemmiati, LEFT BY THE SHIP. We also recognized recognized a filmmaker with the Third Eye Award for best short film. Two films have been honored with this film, including New York-based filmmaker J.P. Chan’s BEIJING HAZE, whose work is always a festival favorite. The 2011 recipient of Third Eye Award for best short film is Brendan Uegama’s HENRY’s GLASSES, the beautiful Asian Canadian short film about a pair of magical glasses. Lastly, we honored filmmaker with the award for Best Feature Film. Other winners of this award include Jessica Yu’s PING PONG PLAYA and Kimberlee Bassford’s PATSY MINK: AHEAD OF THE MAJORITY. The 2011 recipient of the Award for Best Feature Film is SURROGATE VALENTINE, a lyrical collaboration between director Dave Boyle and San Francisco-based singer/songwriter Goh Nakamura. 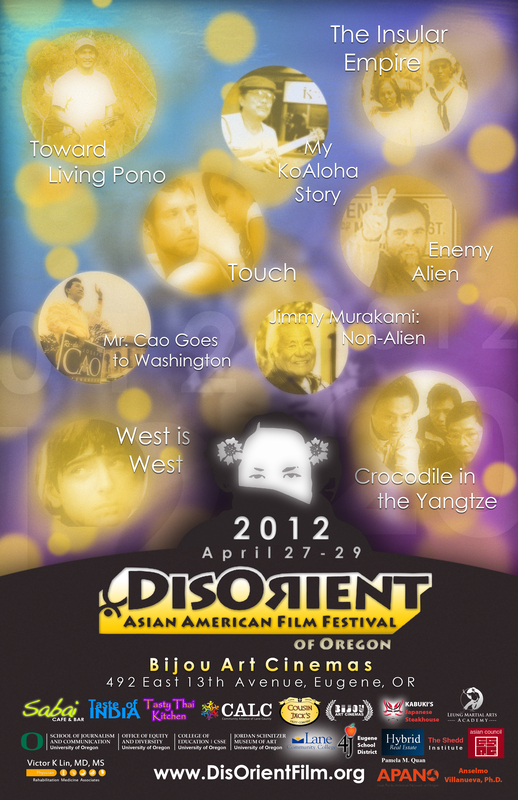 DisOrient Asian American Film Festival of Oregon is a social justice film festival dedicated to deconstructing the media stereotypes of Asians and Asian Americans as "Orientals." We believe in the power of film-as-art to educate, heal and improve the lives of people by giving voice to their experiences. Started in 2006 by artists, educators, and activists, DisOrient is a grassroots and volunteer-run film festival committed to presenting honest portrayals of the diversity of the Asian American experience. When selecting new and exciting films for our festival, we use the W.E.B. DuBois standard of "for us, by us, or about us" that are recent and undistributed works. Buy VIP Passes to DisOrient 2013! DisOrient 2013 Is Happening Now!